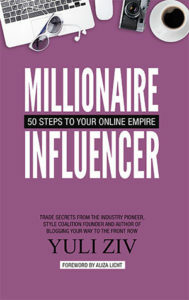 Named one of the Top Women in Media by Folio: magazine, Yuli Ziv is the founder and CEO of Style Coalition, author of Amazon best-seller Blogging Your Way to the Front Row; influencer marketing pioneer, and immigrant founder who bootstrapped her business from zero to millions. In 2017 Style Coalition was acquired Launchmetrics (formerly FashionGPS), the premier global technology and data analytics provider for the Fashion, Luxury & Cosmetic industries. Yuli currently leads company’s Influencer Marketing division and co-manages the USA business unit, while continuing to oversee the Style Coalition business. An internationally known speaker, Yuli delivered speeches at WWD Magic, DLD, Luxury Retail Summit, NY Internet Week, Yale University, NYU and FIT and has been featured in The New York Times, Financial Times, NY Observer, WSJ and Forbes. Since 2008 she has been bringing together the fashion and technology worlds in a series of Fashion 2.0 discussion panels and the annual Awards. One of the pioneers of social media in the fashion space, in 2007 she launched the user-generated magazine My It Things (sold in 2013). Prior to founding her own ventures, Yuli spent years developing interactive online strategies, including her role as a Creative Director at 360i. She holds a BA in Design of Visual Communications from Tel-Aviv University and an MFA in Computer Art from the School of Visual Arts New York. Yuli currently lives and works in New York City.